Over a dozen protesters gathered outside the main gates of Columbia to demand that the University cut ties with Santander. 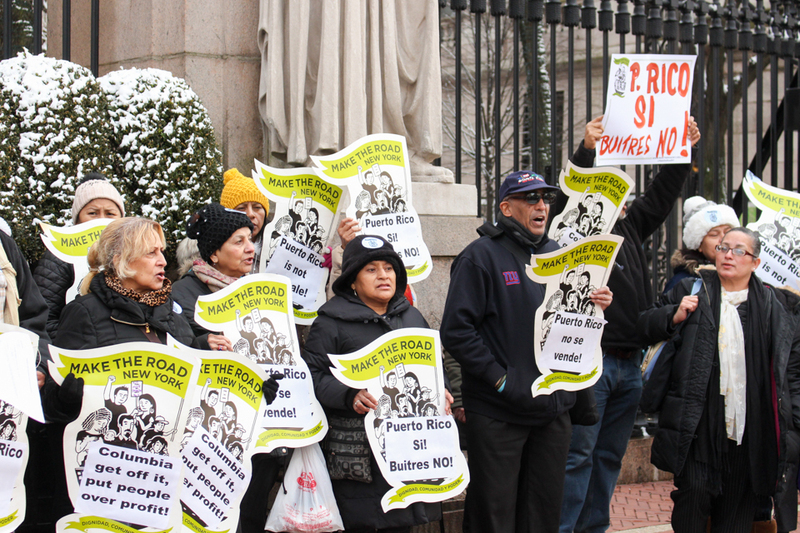 Members of activist organizations Vamos4PR and the Center for Popular Democracy protested the University’s partnership with Santander Bank at a rally outside the 116th Street and Broadway gates on Tuesday morning, claiming the bank is responsible for much of the humanitarian crisis in Puerto Rico. Columbia began a new banking servicing agreement with Santander Bank in the spring of 2016, moving away from its previous partnership with Citibank. A governing group composed of administrators and student representatives made this decision following a comprehensive review of campus banking. A letter sent to students that May by Scott Wright, vice president of Campus Services, cited the bank’s “established international presence” and the fact that “education and universities are a key focus for Santander” as motives for the change. While the University does not invest directly in Santander, it does promote the bank’s services to its students and houses Santander banking centers and no-fee ATMs on campus. Over a dozen protesters gathered outside the gates to demand that the University cut ties with Santander due to its unethical involvement in Puerto Rico. Members of CPD, a nationwide activist organization promoting equality, and Vamos4PR, a group that raises awareness in the U.S. about the crisis in Puerto Rico, referenced a report that claims that Santander Bank, as the principal underwriter of multiple loans, can be held accountable for $61.2 billion of the Puerto Rican government’s $70 billion public debt. The protestors also raised concerns that Santander is demanding the government repay their debt to the bank before addressing the disastrous effects of Hurricane Maria. “At a time when thousands of people do not have water, thousands of people do not have electricity, thousands of children do not have schools because of the hurricane, the Bank of Santander is doing what it can to ensure that the debt to itself is repaid instead of making sure that the people of Puerto Rico get what they need,” Ana María Archila, co-executive director of the CPD, said. Columbia is not the only university being targeted in this call to action. This week the groups have also protested at Harvard and Yale, claiming that both schools invest in Santander Bank through their endowments. The protesters also brought to light the student body’s role in promoting ethical partnerships between the University and banks. Pointing to Columbia as one of the top universities in New York City, which is home to more than a million Puerto Ricans, they called for mindful action from students to protect those in their community. “Columbia is encouraging students to open bank accounts [with] Santander Bank, and I think students have the power to say, ‘We don’t want any of that, we don’t want to profit from the suffering of the people of Puerto Rico, we want Columbia to stand up for dignity.’” Archila said. Though he did not participate in the rally, Puerto Rican student David Rosado, CC ’21, echoed this sentiment, pointing to a need for increased campus awareness of the ongoing crisis in Puerto Rico.